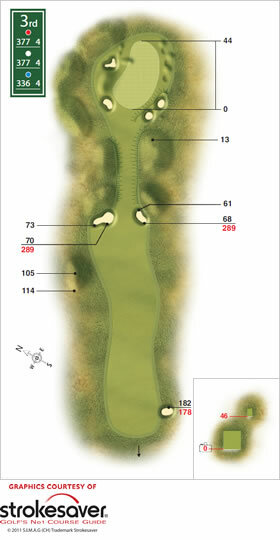 At 290 yards, the fairway virtually disappears into a narrow gully between bunkered mounds. Downwind it’s smart to lay up into the left side of the fairway to get a view of the target, then a short iron to a long green that climbs toward the back. The green is well bunkered at the front, so you need to be up. If the wind is coming from the east this becomes a tough second shot.